It is our hope that in this simple book you will find all you were looking for when you knocked on the monastery door with the intention of spending a year immersing yourself in the search for God. We hope that this almanac reflects our belief that God is found in all the mindless stuff of our days. 1-2 books — $7.00 ea. 3-9 books — $6.00 ea. 10-24 books — $5.00 ea. 25-99 books — $4.00 ea. 100+ books — $3.00 ea. 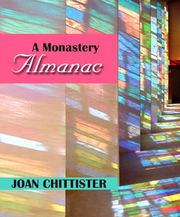 To watch Sr. Joan's message about this book, Click here.